Turn more guests into regulars with the best restaurant loyalty program – no punch cards or apps needed. With Upserve, the guest’s credit card serves as the loyalty card so it’s less expense on your end and less hassle for the guests, increasing the chances for them to sign up and stay with it. It’s always a struggle for restaurants to turn new guests into repeat customers. Part of the problem comes form overly complicated loyalty programs. These programs should be easy to sign up for and hassle-free; that’s where Upserve Loyalty comes in! Most restaurant customer loyalty problems hurt relationships more than they bolster them. Many customers get frustrated when trying to redeem complicated rewards with staff who haven’t been properly briefed on the program in the first place! The perfect example of a bad customer loyalty program? A discount with a ton of confusing exclusions. Another example? A punch card system that requires a customer’s limited wallet space. If they lose the punch card, there’s no way to verify what they’ve already spent with you! So what’s the answer? A restaurant customer loyalty program driven by credit card and cash back credits. 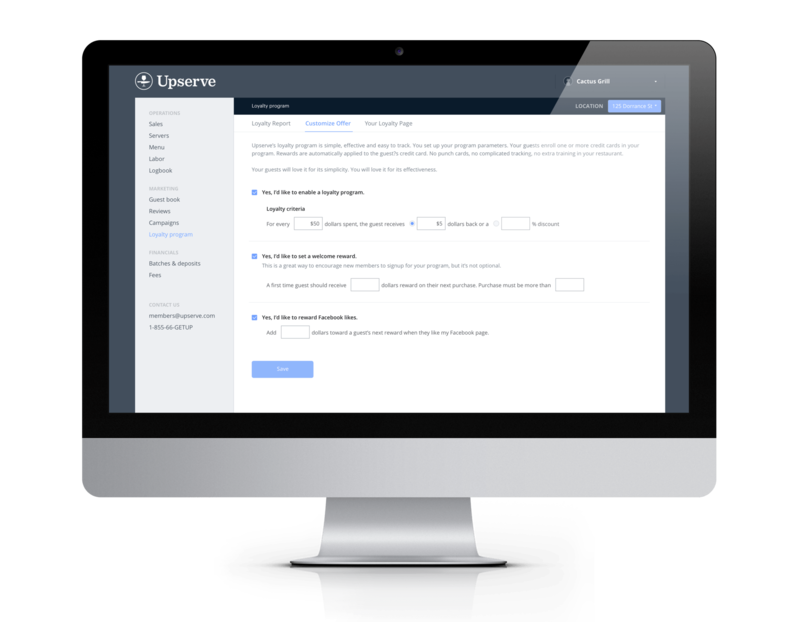 Say goodbye to complicated loyalty programs and hello to Upserve: a modern, hassle-free loyalty program that’s easier to manage for you and your guests, completely customizable, and provides you with insights on behavior for smarter marketing. A waiter greets a group of customers. While taking drink orders, he introduces your loyalty program and that it’s ready to use as soon as they’ve registered with a credit card. Customers rejoice at how easy and conveniently it all works! 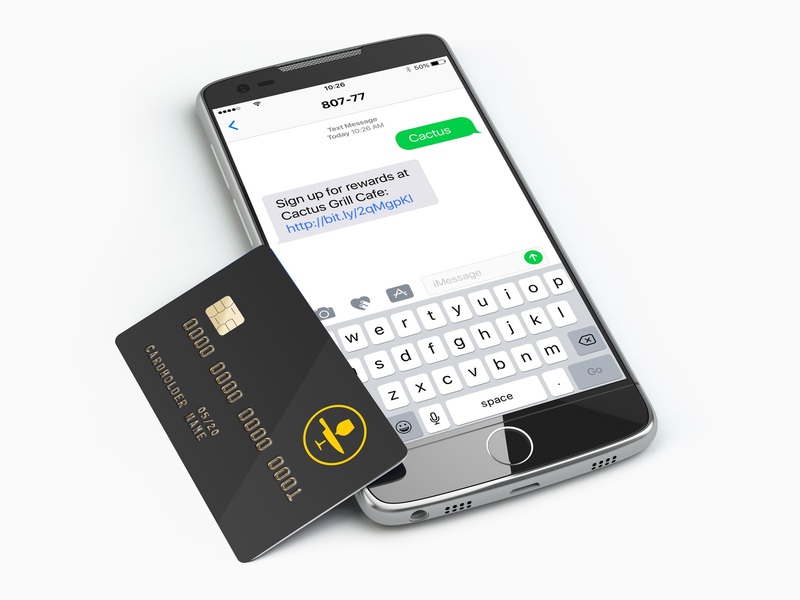 Guests are prompted to join by texting a certain number. Alternatively, they can sign up via email, through your website, or when placing an online order. Once a guest’s credit card is connected, they’re all setup to receive cash back. Happy customers tell their friends, driving more business into your restaurant. Custom smartphone apps don’t come cheap, which is why you might be tempted to think that a sophisticated customer loyalty program will break the bank. Luckily, with Upserve’s loyalty program, your business interests align perfectly with those of your customers. After all, they already have access to your loyalty program in their pockets! Upserve Loyalty works with the same credit cards your guests already use to pay, and the same flow your staff already follows to accept payments using your restaurant POS. No restaurant loyalty cards to remember or apps to download. Using text to join, guests can sign up while waiting for their drink order. The best restaurant loyalty programs reward your best customers. In exchange for continuing to support your business, you can set up your loyalty marketing program to offer incentives in terms of total spend. Remember: You’re trying to build a relationship. So give a little—but don’t give the farm away! Especially when marketing to millennials, Software Advice recommends structuring your program to reward users with points for spending certain dollar amounts. 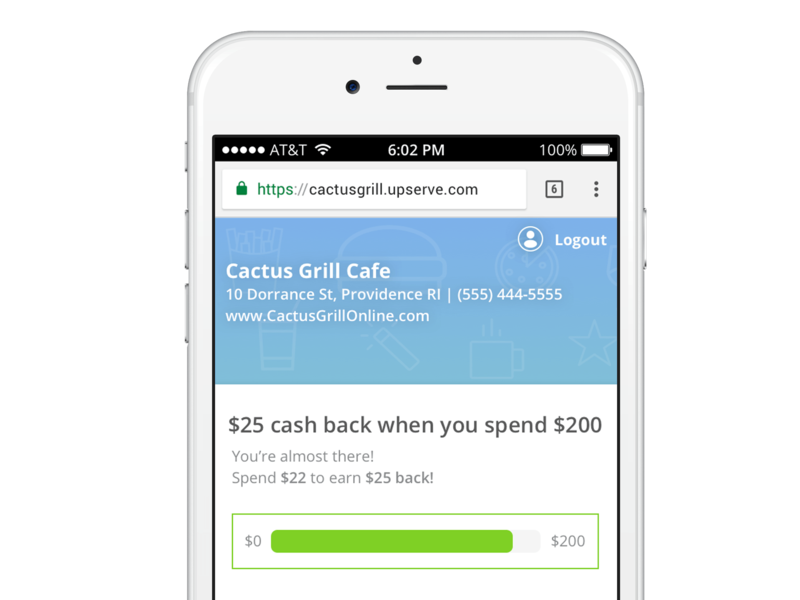 Upserve’s Customer Loyalty program enables your guests to accumulate points for dollars spent, and once customers hit the goal, the reward will be automatically credited back to their card. Did you know? As the result of restaurant loyalty card programs, guests may spend up to 39% more than usual to get their reward faster. Although 57% of surveyed North Americans said they’d prefer to interact with your restaurant customer loyalty program on their mobile device, it’s fair to assume that 100% of them would be even happier with a totally automated process. 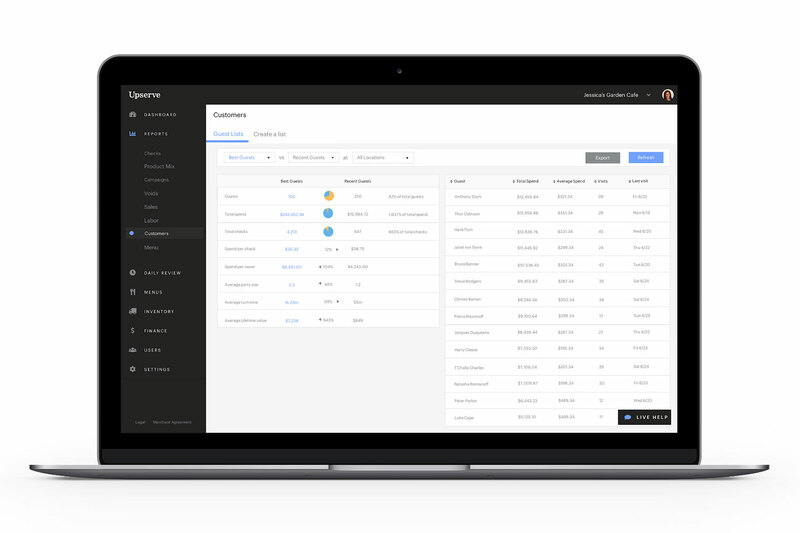 When creating our restaurant loyalty software, Upserve went back to the drawing board and decided to come up with something completely different than the standard option. Our loyalty program management practically runs itself—without input needed from customer or business. By using your customer’s credit card as their loyalty card, guests relax knowing that they’ll always have the opportunity to earn rewards—without adding bulk to their wallet. Since rewards are automatically credited back to the guest, servers never have to worry about discounting the check or missing out on potential tips! Most restaurateurs don’t foresee the unexpected benefits of adding restaurant loyalty programs: tracking spending habits from your most loyal customers! The most successful restaurant loyalty programs are built on an understanding of customers and how they respond to incentives. Using our restaurant loyalty programs list of customers and transactions, you can accurately decode which incentives work for your business—and which may need to be re-examined. As part of working with Upserve, you’ll have access to plenty of help. Specifically, you’ll be paired with a Customer Success Manager who has the knowledge and experience to help you craft a winning restaurant loyalty program. You’ll work closely together to customize a customer loyalty program to fit your restaurant’s branding and desired rewards rules.